Billy The Kid was born in the slums of New York City in 1859. After the death of his father, he traveled west with his mother ending up in Silver City, New Mexico Territory in 1873. Little of substance is known about Billy's life during this period, and myth has replaced fact to shroud the early years of Billy the Kid in folklore. What is known for sure is that he arrived in Lincoln County, New Mexico in 1877 using the name William Bonney. His life would last only four more years, but in that short period he became embroiled in the events that made him a legend. Lincoln County was in a state of near-anarchy in 1877. The native Apache had recently been subdued and the local cattlemen divided themselves into two camps in a fight for local power. Unfortunately for Billy the Kid, he allied himself with the losing side in this "Lincoln County War." Billy worked as a ranch hand for John Tunstall a leader of one faction seeking control of the county. Tunstall befriended the Kid acting in many ways as a surrogate father. Tunstall's ambush and murder in 1878 by a sheriff's posse set the Kid off on a path of revenge. His first victims were the sheriff and his deputy, killed from ambush on the streets of Lincoln. On the run for two years, the Kid was eventually captured, tried, convicted and returned to Lincoln to hang for the murders. However, Lincoln's makeshift jail was no match for Billy the Kid. On the evening of April 28, 1881 as he was climbing the steps returning him to his cell, the Kid made a mad dash, grabbed a six-shooter and shot his guard. Hearing the shots, a second guard ran from across the street only to be gunned down by the Kid standing on the balcony above him. Mounting a horse, William Bonney galloped out of town and into history. 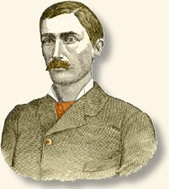 Pat Garrett was elected Sheriff of Lincoln County in 1880 on a reform ticket with the expectation that he would reinstate justice in the area. One of his first acts was to capture Billy the Kid, sending him to trial for the murder of the Lincoln sheriff and his deputy. Garrett was away from Lincoln on county business when the Kid made his escape. Rather than chase after the fugitive, Garrett kept to his ranch mending fences and attending to his cattle. In July, the Sheriff received word that the Kid was hiding out at the abandoned Fort Sumner about 140 miles west of Lincoln. Rounding up two of his deputies, John Poe and Thomas McKinney, Garrett set off in pursuit of the Kid. partner, in Texas, named Jacobs. We unsaddled here, got some coffee, and, on foot, entered an orchard which runs from this point down to a row of old buildings, some of them occupied by Mexicans, not more than sixty yards from Maxwell's house. We approached these houses cautiously, and when within earshot, heard the sound of voices conversing in Spanish. We concealed ourselves quickly and listened; but the distance was too great to hear words, or even distinguish voices. Soon a man arose from the ground, in full view, but too far away to recognize. He wore a broad-brimmed hat, a dark vest and pants, and was in his shirtsleeves. With a few words, which fell like a murmur on our ears, he went to the fence, jumped it, and walked down towards Maxwell's house. Little as we then suspected it, this man was the Kid. We learned, subsequently, that, when he left his companions that night, he went to the house of a Mexican friend, pulled off his hat and boots, threw himself on a bed, and commenced reading a newspaper. He soon, however, hailed his friend, who was sleeping in the room, told him to get up and make some coffee, adding: 'Give me a butcher knife and I will go over to Pete's and get some beef; I'm hungry.' The Mexican arose, handed him the knife, and the Kid, hatless and in his stocking-feet, started to Maxwell's, which was but a few steps distant. When the Kid, by me unrecognized, left the orchard, I motioned to my companions, and we cautiously retreated a short distance, and, to avoid the persons whom we had heard at the houses, took another route, approaching Maxwell's house from the opposite direction. When we reached the porch in front of the building, I left Poe and McKinney at the end of the porch, about twenty feet from the door of Pete's room, and went in. It was near midnight and Pete was in bed. I walked to the head of the bed and sat down on it, beside him, near the pillow. I asked him as to the whereabouts of the Kid. He said that the Kid had certainly been about, but he did not know whether he had left or not. At that moment a man sprang quickly into the door, looking back, and called twice in Spanish, 'Who comes there?' No one replied and he came on in. He was bareheaded. From his step I could perceive he was either barefooted or in his stocking-feet, and held a revolver in his right hand and a butcher knife in his left. He came directly towards me. Before he reached the bed, I whispered: 'Who is it, Pete?' but received no reply for a moment. It struck me that it might be Pete's brother-in-law, Manuel Abreu, who had seen Poe and McKinney, and wanted to know their business. The intruder came close to me, leaned both hands on the bed, his right hand almost touching my knee, and asked, in a low tone: -'Who are they Pete?' -at the same instant Maxwell whispered to me. 'That's him!' Simultaneously the Kid must have seen, or felt, the presence of a third person at the head of the bed. He raised quickly his pistol, a self-cocker, within a foot of my breast. Retreating rapidly across the room he cried: 'Quien es? Quien es?' 'Who's that? Who's that?') All this occurred in a moment. Quickly as possible I drew my revolver and fired, threw my body aside, and fired again. The second shot was useless; the Kid fell dead. He never spoke. A struggle or two, a little strangling sound as he gasped for breath, and the Kid was with his many victims." Garrett, Pat, The Authentic Life of Billy the Kid (1882, republished 1954); Utley, Robert, Billy the Kid: A Short and Violent Life (1989). "The Death Of Billy The Kid, 1881," EyeWitness to History, www.eyewitnesstohistory.com (2001). Pat Garrett was shot in the back in 1908 while traveling in a buckboard from his ranch to a nearby town. His murder was never solved.